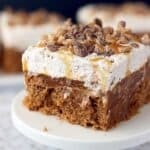 This Double Pumpkin Poke Cake features a spice cake soaked in pumpkin pudding and topped with a cinnamon maple whipped cream. Happy October! Yesterday was my mother’s birthday and a very happy birthday she enjoyed. She told me that she drove around southern Vermont taking pictures of the foliage. That is what we New Englanders call leaf peeping. Yes, it’s a real thing. As much as I love the fall season, I don’t miss the leaf peepers. Sure, they are an essential part of the economy in our tourist town, but they also cause quite a bit of danger by driving slowly, suddenly stopping, or parking in the middle of the road to stop and take pictures. It’s kind of a running joke where I’m from. Well, even I can appreciate a good day of leaf peeping, so I am glad you enjoyed yourself, mom! 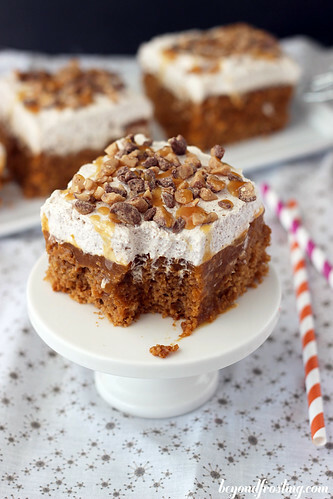 Now it’s time for cake, Double Pumpkin Poke Cake. 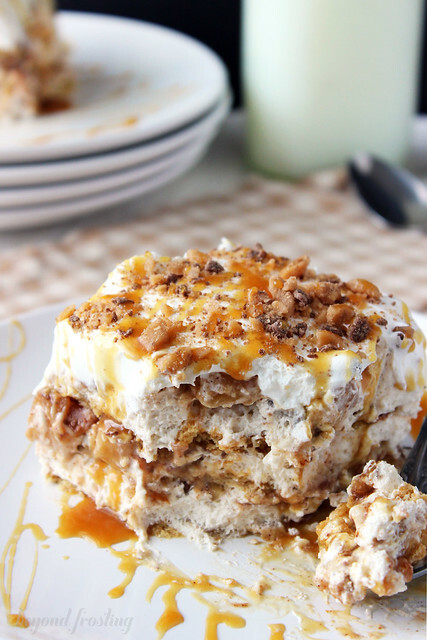 It is a pumpkin spice cake soaked in pumpkin spice pudding and topped with a cinnamon maple whipped cream. I would say that I am “obsessed” with this whipped cream, but people tell me I am “obsessed” with too many things. So I am just going to tell you that it is down right amazing and you need to make it. 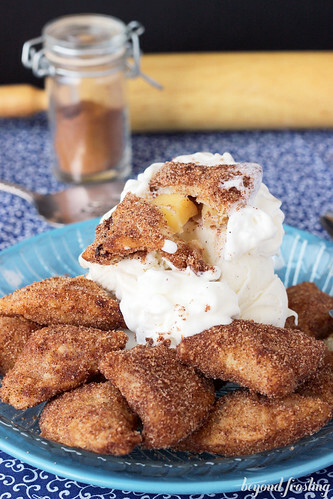 I made it with these Brown Butter Peach Shortbread Parfaits as well. 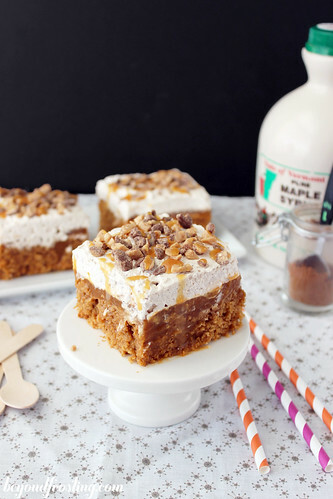 Well it is the perfect topping for this poke cake. 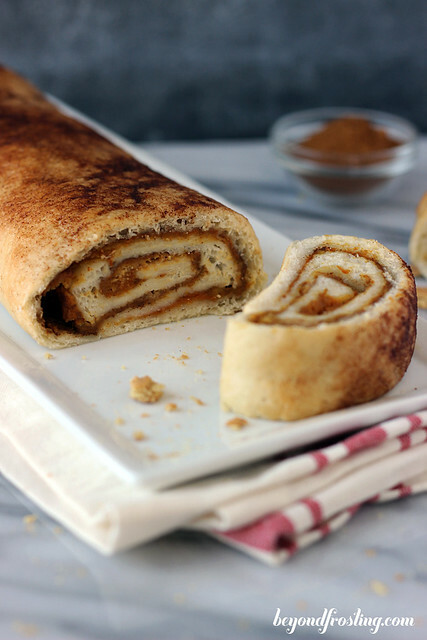 This cake is kind of like mixing the best of both worlds; you get the taste of pumpkin pie mixed with texture of a fluffy cake. 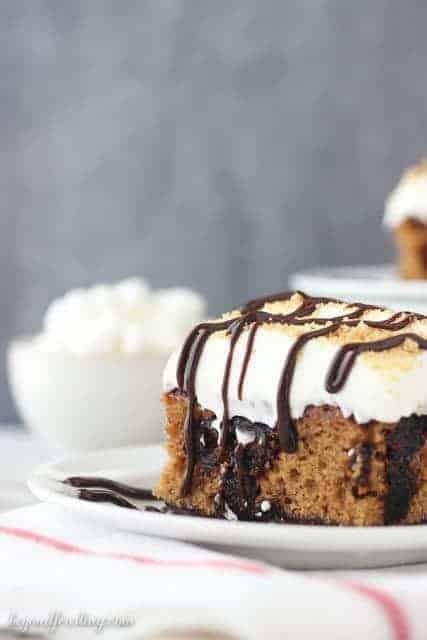 The pudding adds an incredibly moistness to the cake, and topped with a decadent whipped cream it’s to die for. This cake is relatively easy to whip together, you just have to wait a little bit for the pudding to set. 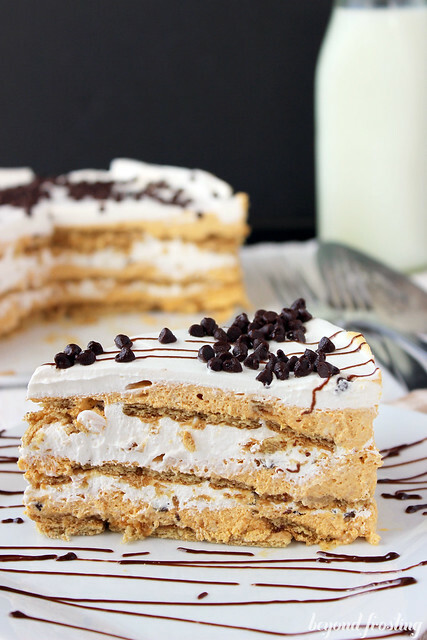 This dessert is a great way to impress your friends. Prepare the cake first. Mix all dry ingredients in your mixing bowl and mix slightly to combine. Add eggs, oil, milk and sour cream. Beat on medium speed until well combined. Bake cake for 18-22 minutes until golden brown on top. Check for doneness by inserting a toothpick in the middle of the cake. If the toothpick comes out clean, your cake is done. Allow cake to cool for fifteen minutes. While the cake is still warm, take the end of a wooden spoon or another round object and poke holes all over the top of your cake. Prepare the pudding. In a separate bowl, combine the 2 packages of instant pumpkin spice pudding and milk together. Whisk until well combined. Before the pudding sets, while it is still pourable, dump the pudding over top of the cake and spread with a spatula if necessary. Allow the pudding and cake to set in the fridge for at least an hour. In the meantime, you can prepare your whipped cream. Put the bowl and whisk attachment in the freezer for 5-10 minutes to get them really cold (this step is optional, but a common practice I use). Using the wire whisk attachment, whip heavy cream on medium high speed for several minutes until soft peaks form. Slowly add maple syrup and continuing mixing until incorporated. Next Add cinnamon and mix just until combine. Proceed to slowly add the powdered sugar and beat until stiff peaks form. 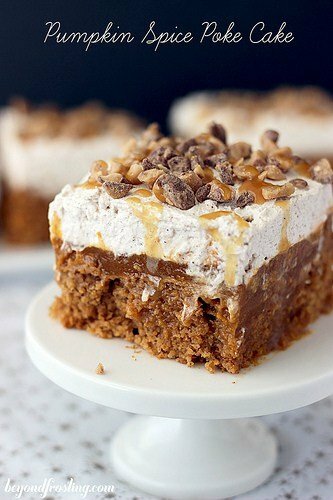 Top cake with cinnamon maple whipped cream and sprinkle with milk chocolate toffee bits. Serve immediately or keep refrigerated until ready to serve. I live in Toronto, Canada and i know we don’t have pumpkin pudding here but fortunately someone wrote in saying they used vanilla pudding and the cake turned out great. can’t wait to try it. plus I love that you use real whipped cream – one of my 3 favourite foods. the others being pizza and the third changes to whatever i’m eating and enjoying.